Mailing solutions provider, AMS, has launched the Memjet S1 colour envelope & packaging printer. The desktop printer has the capability to handle large production runs and can print full colour on to heavy stock up to 1cm in thickness. 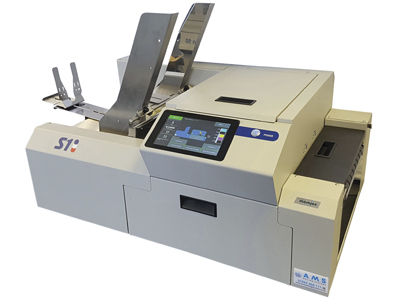 Currently exclusive to AMS in the UK, the US built S1 card and envelope printer is capable of printing full process colour at 7500 A5 sheets per hour, producing high-quality, cost-effective imaging. It can print full bleed, edge-to-edge on paper and card up to 215 x 762mm. The S1 printer can be used for plain, padded and card backed envelopes, card stock, boxes, kraft pouches and paper bags. The colour printer can also print on to window substrates, ideal for retail industries. Also included are five high capacity ink tanks that each hold 250ml of ink, which combined with the long-life print head, ensures the cost per page to print is kept low. A touchscreen display with an integrated control centre makes the system user friendly.